Scientific research commissioned by Natuurmonumenten shows that the number of insects is declining dramatically in the Netherlands. Measurements and analyses in recent decades show a decline of 54 percent (ground beetles) and 72 percent (ground beetles) in nature reserves. This represents a dramatic fall in these groups of insects, which is in line with the results of recent German, French, English and Dutch studies. And this is bad, as it has a huge impact on the cycle of life. Natuurmonumenten commissioned scientists from Radboud University (Caspar Hallmann, Eelke Jongejans and Hans de Kroon) and EIS (Insect Knowledge Centre) to perform studies on insect trends in the Netherlands. Two long-term studies on insect populations in nature reserves were eligible for analysis: 'De Kaaistoep' and 'Wijster.' An analysis of these two studies shows that the number of ground beetles counted in Wijster (nature reserve in Drenthe) has fallen by 72 percent over the past 22 years. The number of moths in De Kaaistoep (nature reserve in North Brabant) has fallen by 54 percent over 20 years. These two insect groups contain a total of 1,100 species, approximately 6 percent of all insect species that occur in the Netherlands. The results are significant. The studies used totally different research methods, but both showed a strongly decreasing trend. Director of Natuurmonumenten Marc van den Tweel says, "This means that the results are in line with research by Radboud University that was published at the end of 2017 and which showed that 76 percent of insects have disappeared over the last 27 years." The number of studies containing ominous reports is rapidly stacking up. Of the 47 butterfly species measured in the Netherlands half have declined since 1992. A French study showed an average decline of 33 percent in bird populations since 2000. And the reason for this: there are not enough insects to feed them. In the two Dutch studies, other insect groups were also analysed in detail. In addition to moths and ground beetles, these groups also show a worrying decline. Results show a drop of 64 percent over 20 years (beetles in De Kaaistoep) and 62 percent over 10 years (caddisflies in De Kaaistoep). Only the bug group remains stable. The scientists concluded that, calculated over a period of 27 years, about two thirds of the number of individuals in the insect groups studied have disappeared. 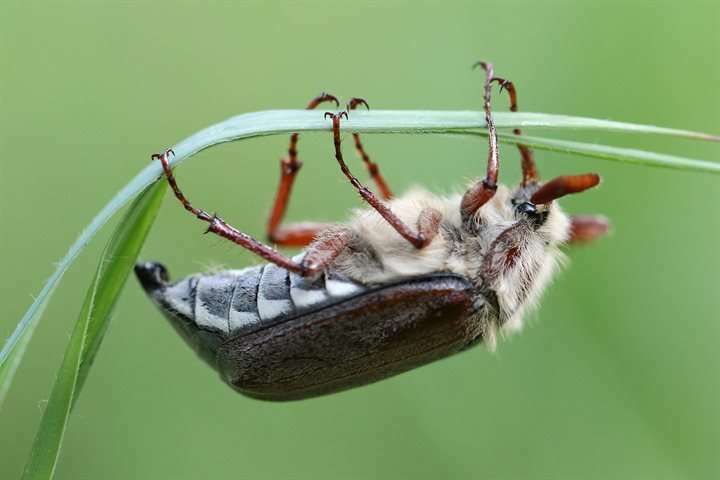 The Dutch Minister Schouten (Agriculture, Nature and Food Quality) recently sent a report to the Lower House that described the Dutch situation with regard to insects. The report states that the long-term decline in insect populations in the Netherlands may possibly be explained by factors related to developments in agriculture. This means intensification of agricultural land use and increased use of nitrogen, phosphorus and pesticides. The fragmentation of natural living areas is also a contributory factor to the decline. The report also states that the German research was carried out using robust methods and that there is still very little data available on insects in the Netherlands. A number of datasets are eligible for a follow-up study because of their high quality. De Kaaistoep and Wijster belong to this group because of their size and accuracy. Van den Tweel: "Following the publication of the German study, Natuurmonumenten commissioned scientists to speed up the analyses, so that we can obtain a clearer picture in the Netherlands too, as there is very little Dutch data available on insect trends. We therefore endorse the call by scientists to set up a national measuring network for insects in order to obtain a broader and more complete picture, also on possible causes and long-term trends. The results from this study highlight how large and serious the problem is in our country. If you realise that this study was carried out in nature reserves – therefore not on agricultural or industrial land or land under development, you dread to think what the situation is like in the rest of our country. Our environment, our ecological basis is collapsing." Van den Tweel says, "Agriculture is one of the main managers of our rural areas. Farming practices have a direct effect on nature—plants, animals, soil and water. At the same time the Netherlands makes the most intensive use of crop protection agents of all European countries. This is something that needs to change, we need less chemistry and more biology and innovation. Bulk production aimed at the global market has no long-term future in a small country like ours. The future of our farmers lies in producing quality products for our country and the countries around us. Dutch family businesses must be able to earn a good living from this. This means a more nature-inclusive form of agriculture that can continue to exist in the long term too: simply by making more space for nature in agricultural areas." Natuurmonumenten is collaborating with farmers, scientists, banks and companies on a national Delta Plan for Biodiversity Recovery. Van den Tweel: "The objective of this plan is ambitious – but it has to be if we want to reverse the tide. A healthy agriculture also means that farmers who work with nature should get an honest price for their product. And this calls for a different approach to our country, our landscape and our agriculture."